Hazard: A kit installed on the tankless water heaters and boilers to convert them from natural gas to propane can cause the unit to produce excessive amounts of carbon monoxide, posing a risk of carbon monoxide poisoning to consumers. Consumers should immediately stop using the recalled water heaters and boilers that are using propane gas and contact Navien for a free replacement conversion kit. Consumers who continue use of the water heaters and boilers while awaiting repair, should have a working carbon monoxide alarm installed outside of sleeping areas in the home. Consumer Contact: Navien at 800-244-8202 from 8 a.m. to 5 p.m. PT or e-mail recall@navien.com or online at https://www.navieninc.com/news for more information. 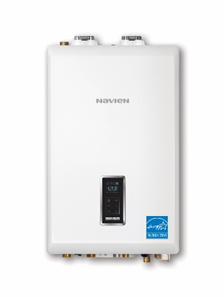 Description: This recall involves only Navien condensing tankless water heaters and combination boilers with model numbers NPE-180A, NPE-180S and NCB-180E that have been or will be converted from using natural gas to propane gas. The recalled water heaters and combination boilers were manufactured between July 9, 2018 through October 14, 2018. The manufacturing date is identified within the serial number. The serial number is printed on a label which is affixed to the side of the unit and on the product packaging. The first two digits identify the year, the next single digit identifies the month, and the last two digits identify the day. For example, 18709 stands for July 9, 2018. X stands for October. Sold At: Wholesale distributors to installers nationwide from August 2018 through October 2018 for about $1,400 to $1,700 for water heaters and $3,800 for combination boilers. Importer(s): Navien Inc., of Irvine, Calif.